Ceremonies in the USA, Europe and in other regions and countries where 9/11 business is taken seriously have, with time, shifted focus. The annual show of gravitas and determination to fight and win the War on Terror, cranked up on back of the New York and Washington attacks of September 2001, has a new objective: deflecting, parrying and diluting a scary future. Trends forecasters will all tell you that future looks bad and the economy looks even worse. 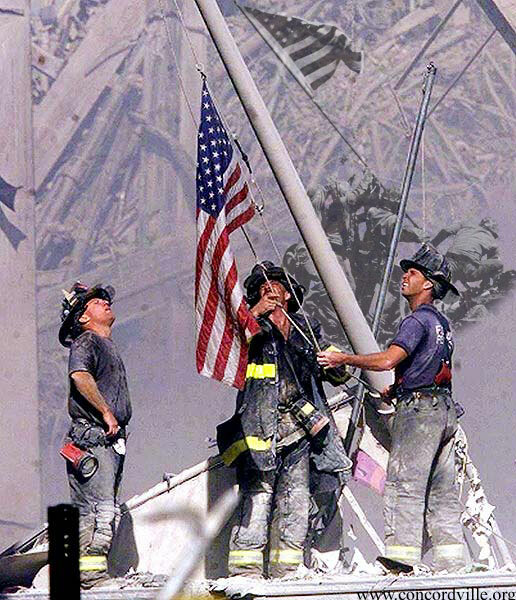 But George W. Bush and Barack Obama still stand together, united to fight evil, with a show of force at Ground Zero. As anyone can guess, putting white ribbons in the hair of US schoolchildren is more newsworthy(and cheaper) than treating cancer victims from the tens of thousands of tons of asbestos, insecticides and dioxin that spewed out as the Twin Towers, and building WTC 7(untouched by any airplane) dramatically crashed to the ground in seconds. Public solidarity and national pride are important at this dangerous time, hence, 9/11 festivities have been internationalized with an attempt being made- like attempts in Europe and Japan, to import the US Halloween-style festival and to capitalize on its commercial spin-offs. For the 9/11 ‘festival of hope’, the goal is justifying the military invasions and occupations of both Afghanistan and Iraq. This new war festival however generates nothing in revenues and costs vast sums of public cash on an unwinnable war – an exact remake of the Soviet Union’s lost war in Afghanistan – proving that other people can be just as stupid as the Soviets. Never mind the blowback of pure hatred against the west that the 9/11 farce generates right across the Muslim world and south Asia. What counts is the official, reassuring and idiot-friendly version of “what really happened” in New York and Washington in Sept 2001. This is now a mass market comfort theme, belted out by all mainstream media and is a precious link with a receding and different past. In September 2011 the US political, corporate and media elites and their European fellow travellers- call them running dogs or yippy poodles, have saturated world media with all-day-long special reports on the Atrocity of the Century. Time is also shrewdly allocated for marginalizing skeptics, or “truthers”. Shame on you, if you don’t believe. 9/11 is now a strange mixture of alternate reality and new religion. 9/11 is now the official way to forget the present and future of debts, deficits, unemployment and economic crises – if only for an excruciatingly long weekend. 9/11's ten year anniversary has morphed into a morbid "festival of war" for the US and the world. For the American economy – and most other developed economies, from the European Union to Japan – the real crisis is the amount of money paid to commercial bankers and insurers over the last four years. What happened to it? Will Greece collapse, taking Europe’s banks with it, like a collapsing Twin Tower as the fires of its sovereign debt light the higher floors of the Tower of Doom? For American banks, filings to the US Securities and Exchange Commission show that the bailout sums handed to them by G W Bush and Barry Obama now stands, in September 2011, at an astounding $2 200 billion, or $2.2 trillion, racked up in a little more than 4 years. European commercial banks have received less well-defined, better hidden bailouts from public funds, but likely amounts to September 2011 are probably $ 1.75 trillion; Japan’s ruined banks have received more than $ 750 billion. Still, all the banks will require more, a lot more. This is because, like the 9/11 fantasy, the show has to go on. The serial rout of banks and their related and dependent insurance companies, brokers and investment houses will continue. Extrapolating over the coming decade and only for the USA, the total amounts to be taken by the financial sector, led by the banks, will approach over $5 trillion. Yet, no European, Japanese or American political decider, either in power or in opposition, so terribly and publicly concerned about 9/11 once a year, shows any sign of being willing to cut future debt-driven bailouts for private banks. This will inevitably produce further and deeper government deficits. This stubborn refusal to face reality can be compared with the child-like official belief the Twin Towers and WTC 7 fell down almost instantly due to burning jet fuel and “all by themselves”. Ignoring reality and denying the future, the critical banking crisis is also another whipped-dog attempt to not admit failure and muddle through another day. Doing this, increasingly surely, the ultimate economic catastrophe becomes possible: the collapse of all world moneys, the complete implosion of the global economy. Real war would almost certainly follow – not playacting with bearded hermits in Afghan caves and drone attacks on Yemenite brigands, Pakistani goatherders and bandits – but even the playact War on Terror does not come cheap. For the USA, the ultimate big spender on supposedly small surgical conflicts and humanitarian interventions “over the horizon”, the amounts spent are relatively well known: probable US war spending in the 10 years since 2001 totals between $ 2.2 and $ 2.8 trillion – much less than the banks have been able to siphon, in the last 3 years. The ugly truth of this matter is that none of this cash can be invested in protecting US jobs, building roads, schools, factories, hospitals, offices, public transport or any other long-term projects. Public cash is showered on the financial, defense sectors, and overseas contracts creating a few high cost jobs but in general this money is directly transferred from spending in the real economy, to the shadow economy of bank executives, employees and shareholders, off-shore holding companies and our clean fingernailed Indiana Jones heroes killing villagers and rendering taxi drivers somewhere over the horizon. While the bank executives come out as big winners, this is not at all the case for bank employees faced with recurring and massive redundancy programs, nor for bank shareholders, or the average grunt soldier. Real bank and finance sector share values in the USA, Europe and Japan are again in free fall, tumbling in unison, by 33 percent to more than 65 percent in the 5 weeks from August 1st, 2011 to the present. More transfers – politely called “bank recapitalization” – will soon be needed. These transfers represent a cunning tax on everyone else, whether private citizen and consumers or economically active entities. Most incredibly, these are rich rewards for those “players” who helped cause, and then intensify today’s financial and economic troubles that affect all countries of the developed world. This tiny percentage (well below 5 percent) of all persons and all economic entities in the affected countries is the only class that is not suffering from the crisis they have caused – and in many cases the perpetrators of the crime are massively benefiting from the aggravation of the global crisis. The military and security services, whether the US Army or the new Afghan Army supposedly loyal to Hamid Karzai, whether the USA’s FBI and CIA or France’s DGSE and the UK’s MI5 and MI6 are all similar in the dependence on the public purse. When things get worse – they also ask for more. Using the financial analogy of leverage rather than skills, of pouring oil on fires already burning, then demanding public money to quench the fires and calm the rout, the defence and security establishment has only mimicked the blackmailing scam of failed financial gamblers. As we know, the corporate kleptocracy which operates the world’s biggest banks and insurance companies has a simple strategy: privatize the profits and offload the losses to anybody else, meaning governments and taxpayers. Simply because of this, all central banks and monetary authorities have no choice at all but to keep interest rates at artificially low levels. Both publicly, and secretly they give loans at extreme low rates of interest to the banks, like obedient poodles. The defense and security mafias, establishment or sector operates a strategy of self preservation and profiteering that is also simple. Without war, it cannot continue to grow, but war is no longer possible with new, potential, and very dangerous enemies such as China and India, and other large well-armed nations – able to hit back devastatingly hard. War must now be targeted at small countries with small armies – and of course no nuclear weapons. The search for enemies is also brought back home, inside the home countries of this evil doctrine, creating the police state at war with its own population. Since 2001, the search for, and manufacture of new enemies has been crowned with success. The reward for the defence and security elites is immense: although well behind the grab made by the banking elites, the equivalent of around $2.5 trillion dollars has been spent by the US alone in a single decade on fantasist and unreal enemies, without ever facing any armed forces able to hit back with deadly force. What could be more courageous and progressive? For the banking and financial mafia, like the defense and security establishment, the risk of massive or total loss was always hidden, always denied. But with another hollow celebration of the 9/11 farce, and another intensification of the European and US banking and debt crises, the potential for total loss on all fronts rises, yet again. For private bankers and insurers, brokers and exchange operators who systematically lied about the risks of their 24/7 gambling spree, and the defense and security mafia who promote the lie about 9/11 and the risk of “asymmetric” wars – we have moved so close to the precipice that denying this reality is harder and harder, each and every day. As Barack Obama said on Sunday September 11, 2011: “God is our refuge”. Andrew McKillop is guest writer and energy markets analyst with more than 30 years experience in the energy, economic and finance domains. He trained at London UK’s University College, and has extensive experience in energy policy, project administration, including the development and financing of alternate energy, including projects for OPEC and the EU.